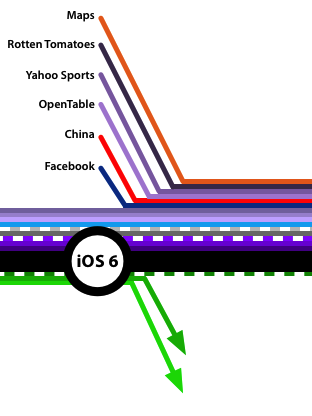 When Apple introduced iOS 6 to the world at this year's WWDC, one of the most talked about moves was Apple’s decision to step away from their partnership with Google Maps and create their own maps app. In many respects, it wasn’t too surprising given the increasingly strenuous relationship between Apple and Google in the years since the iPhone launched and Google became a competitor with Android, but in recent weeks it was also revealed that YouTube will also no longer be included as a pre-installed app from iOS 6. That leaves Google Search as the only remaining Google service to be integrated into iOS. Yet whilst Apple has been severing its relationship with Google, it has been courting numerous other service providers and integrating them into iOS over the past few years. Curious to visualise this information, I made a list of every notable service that has been integrated with iOS (and when) and then created the above graphic (click on it to view a larger version). 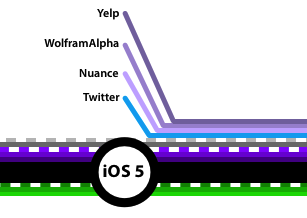 When I had compiled the list, it was pretty compelling (and longer than I had realised), but I think the graphic takes it to the next level and really tells a story about iOS and Apple’s relationship with other services. Now, you can’t really think about the internet of course without thinking about Google. That was Steve Jobs at Apple’s 2007 Macworld keynote in which he announced the iPhone. At the iPhone’s inception it was clear that Google was a significant partner, providing Search, Mapping and of course YouTube functionality in the iPhone. The partnership even merited an appearance by then-Google CEO, Eric Schmidt during the keynote whom spoke a few words about the partnership and the iPhone. iOS 1 (or more correctly, iPhone OS) of course didn’t have an App Store at this point, so the core functionality of the OS was incredibly important. Apple completely implemented its iTunes Store and built a number of native applications, including YouTube, Maps, Weather and Stocks which were 'powered' by Google and Yahoo services. Although the apps were built internally, it relied upon the two companies for the services that powered those four apps - it was something Apple couldn't effectively do themselves at the time. In addition, both the Google and Yahoo search engines were offered to users in mobile Safari. Apple introduced the App Store in iOS 2 (iPhone OS 2) and for the following few years Apple focused on improving the core OS functionality and giving developers more power and control to make better and better apps. The App Store thus kept iOS competitive and instead largely nullified the need for Apple to integrate any additional services, tools or apps into the OS. The App Store would instead be the solution, because as Apple liked to say, "there’s an app for that". In fact the only exception to this general movement was the integration of Microsoft Exchange into iPhone OS 2, something that was somewhat of a necessity if the iPhone was to succeed in the enterprise. Finally, and on something of a tangent, iTunes Ping was released a few months after iOS 4 and was intended to support Facebook for finding your friends to add to Ping. Visible in screenshots at the keynote and mentioned by Phil Schiller in a post-keynote interview, it was subsequently pulled the next day after Facebook blocked it. Although not explicitly a service that was integrated with iOS, I think its worth pointing out how Apple failed to reach an agreement with Facebook on this occasion. It could perhaps be one factor in explaining why Facebook was also absent in iOS 5 despite Twitter gaining significant integration. Twitter was perhaps the first non-Apple service to be so widely integrated into iOS. Not only was it available in the Photos app, Safari and other locations in the form of a Tweet Sheet but developers also had a lot of tools to integrate Twitter in their apps. Developers could easily allow users to give their app acess to the user's Twitter account - which was already connected at the system level, additionally developers could also use those same Tweet sheets without having to develop their own version. Twitter benefitted immensely from Apple’s move to integrate Twitter into iOS 5 and saw a threefold increase in sign-ups after the launch of iOS 5. Yet perhaps the bigger story of iOS 5 and third party service integration would be that of Siri. The very roots of Siri don’t come from Apple - it was an app that Apple acquried in April of 2010. Beyond that, Siri relied on Nuance’s voice dictation service and still does today. Then, beyond the OS level actions that Siri can do, it also interacts with WolframAlpha, Yelp, Yahoo Weather and Yahoo Stocks to answer further questions. Now this isn’t to discount the amount of work that Apple themselves did to transform Siri the app, into Siri the personal assistant in iOS 5. I merely wish to bring to attention the striking fact that Apple, the company that is ruthless at controlling all aspects of the user experience, relies heavily and more so than anywhere else on third parties in powering Siri (more on this idea soon). If iOS 5 was testing the waters of integrating third party services, then iOS 6 can be seen as Apple diving head first into this idea. Facebook will be completely integrated with iOS 6, just like Twitter was in iOS 5 and the integration will get a bit deeper with buttons for both share sheets in Notification Center. Siri also gets more intelligent with addition more third party services in processing questions and requests - notably including Rotten Tomatoes, OpenTable and Yahoo Sports. I have no doubt that Siri will continue to get smarter with additional services being integrated in future releases, particularly services that may be more popular outside the US, where the current services exist primarily. But what has attracted most headlines is undoubtedly the removal of Google Maps and YouTube from iOS 6. What began as services vital to completeing the experience in iOS 1, are no longer needed in iOS 6. Google Maps has been replaced by Apple’s own Maps app that, like Siri, relies on a bevvy of third party services and companies that Apple has acquired. The big third party partner is TomTom, but as is evident in the legal documents present, there are dozens of other partnerships that Apple has had to form in order to replace Google Maps. Beyond that, in the years leading up to iOS 6, Apple acquired a number of mapping companies to achieve the talent and products needed to create their own Maps app, including Poly9, Placebase and C3 Technologies. This was no small move in replacing Google Maps. YouTube is a different story, and as Matthew Panzarino of TNW argued well, it may be in the best interests of Google too that Apple has removed YouTube. So now that Apple is removing Google Maps and YouTube from iOS, all that remains of Google in iOS is Google Search - which, don’t forget, was obfuscated in iOS 4’s Safari to simply be called “Search”. There really isn’t much further Apple can go in walking away from Google now - perhaps removing Google as the default search engine but that would inevitably be seen as remarkably petty and immature move when Google still commands the search landscape. And I can’t see Apple making users to choose at setup which search engine they use when Apple likes to keep setup as simple as possible. Finally, I must take the time to mention Apple’s move to integrate a number of Chinese services into iOS 6. Baidu, Youku, Tudou and Sina Weibo are all integrated and represent Apple’s serious commitment to addressing the truly huge Chinese market which offers incredible growth opportunities for them. Apple has increased the number of third party services that it integrates into iOS, but it continues to do so very carefully and takes steps to make any branding as minimal as possible. 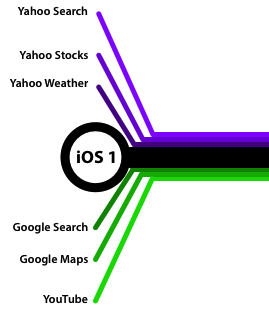 Right from day one, the Weather, Stocks, YouTube and Maps apps were inherently powered by Yahoo and Google - but the apps were designed by Apple and there was no overt branding. Weather and Stocks to this day exhibit just a single, Y! icon in the corner, whilst there was very minimal branding in the YouTube and Maps apps.Similarly, all the services that are integrated with Siri feature small and subtle branding that is almost invisible at a glance. About the only exception to Apple’s obfuscation of third party branding would be that of Twitter and Facebook which feature more obvious branding, particularly on their share sheets which strongly resemble their respective brands. It makes perfect sense as to why (excluding the social networks, which retain branding to remain instantly recognisable to users), Apple is obfuscating the third party branding; they still wants users to think and feel as though it is all a native experience. That's why Apple themselves develop the implementation of these services, to keep control over the aspect that matters most: the user experience. Apple's move to deeply integrate third party services is arguably the best of both worlds: leverage successful and powerful services (i.e. Yelp, WolframAlpha, etc) and then implement them as if Apple themselves had built the services.